You have lots of photos and videos snapped by iPhone 4 / 4S great camera, sometimes, you want to copy them to your iPad or the other iPhone of your friends or family. Using iTunes is painful, it is even impossible while you want to keep the photo library of the device that you want to copy to unchanged. Today, I will introduce the iPad / iPhone app named “Wireless Transfer App”, with the help of Wi-Fi network, you can easily share your iPhone photos and videos, transfer them to other Apple devices quickly and wirelessly. You don’t need iTunes, USB cable. First of all, grab the app from AppStore by clicking here. You need to run this app on both devices, If you use the same Apple ID, you only need to pay once to run this app on multiple devices. You only need to select the photos or videos that you want to transfer to your iPad, and the app will download the files from your iPhone to iPad wirelessly. As you can see from above screenshot, transfer photos and videos from iPhone to iPad is easy, quick and no need for USB cables. You can also transfer from iPad to iPhone, iPhone to iPhone, iPad to iPad, iPod touch is also supported. Further more, this app also can transfer photos and videos to and from computers, no other softwares required. For more information, please visit the app’s website by clicking here. We have received lots of reviews on AppStore, Thank you for your support to us. 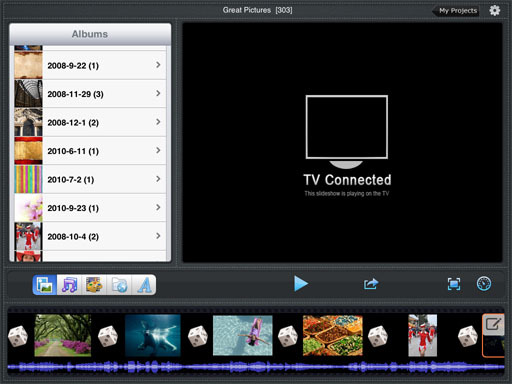 This article will show you a video maker app for iPad for creating videos with pictures. 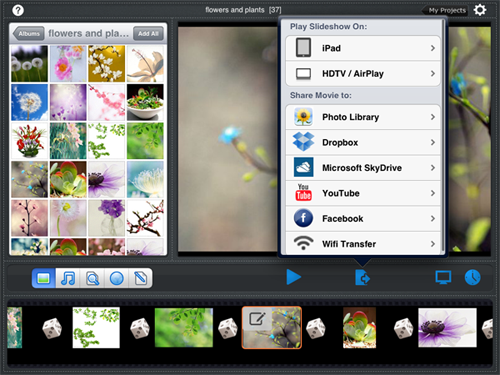 With this iPad video app, you can easily create a picture video with music, transitions, pan&zoom and other effects. Then you can enjoy eye-catching videos on iPad with full screen. For iPad’s small size and powerful functions, people like using it to take pictures , watch movies, listen to music etc. Lying on bed, you can enjoy movies with iPad in your hands. 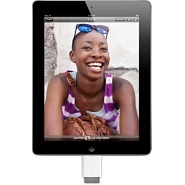 What about making a video with your own own pictures on iPad for viewing, recalling best memories? Sounds like a good idea. 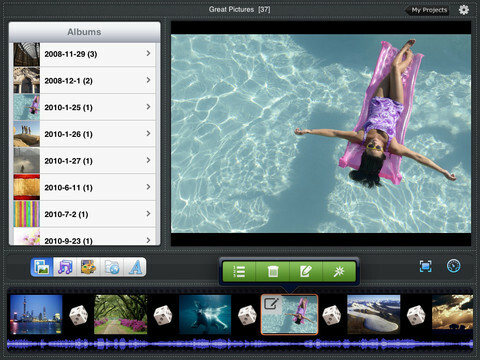 Download iPad video software and convert your pictures to wonderful videos. iPad Video App is available on AppStore for only $3.99 and it enables you to create videos using pictures from iPad iPhoto library and web album photos , including photos in Picasa, Facebook and Flickr. 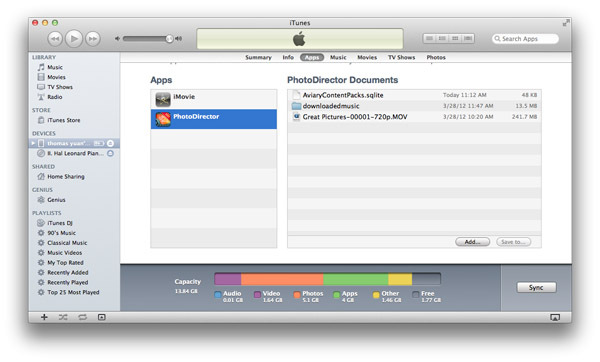 1.Import photos to the app from iPhoto library and web albums. 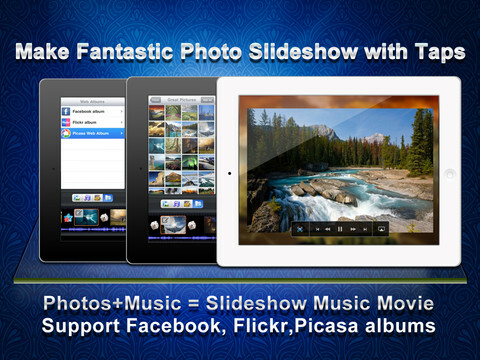 The program enables you to import photos not only from iPad, but from websites, including Facebook, Flickr and Picasa. 2. Add background music from iPad. If you like, you can add more than one songs as background music to play with your pictures. 3. Apply transitions, pan&zoom, themes, beautiful images. There are many video effects available for you to decorate your video . So you can add these effects to make an expected video. 4.Edit photos with its built-in photo editor. The app provides some basic photo editing functions, which allow you to correct pictures for video using. You can add enhance effects, rotate photos, crop pic, remove red eye, adjust brightness and contrast, set sharpness etc. 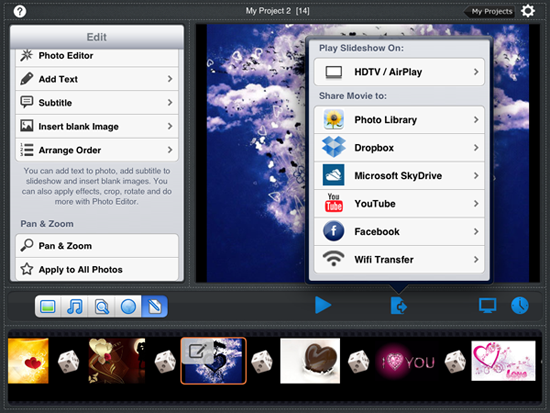 Save the video to iPad iPhoto library. Upload the video to Facebook for sharing with friends from the app. Upload the video to your YouTube account for saving and sharing fro the app. If you do not want to save the video , you can view it directly on iPad in the software or play it on widescreen TV, video projection screen, or other HDMI- compatible display with Apple Digital AV Adapter. The app creates videos with a highest definition of 720p HD video.Also you can choose a low definition video output. How to View RAW images on your iPad? As a digital camera fans or professional photographer, you may prefer the RAW image format . The RAW format keeps all details, whereas compressed jpg photos decreases in quality. For iTunes will be automatically converts all image formats to JPEG before syncing, so you can not get Raw photos to iPad. However you can use Apple iPad Camera Connection Kit. 2. Downloading RAW photos in digital camera to iPad instead of compressed JPEG. Disadvantages : you need to prepare a huge space for RAW images. After importing Raw photos from your camera to iPad, you can view them on your iPad in an interesting way with best iPad Photo Viewer. The iPad photo viewer enables you to view photos with music , transitions, themes(like wedding, Christmas) and more effects. 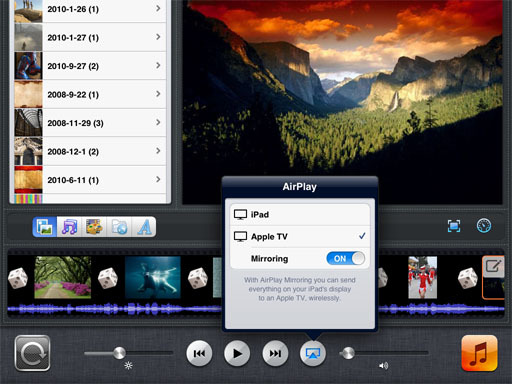 It supports Airplay, so you can even stream your photos to HDTV via Airplay with it. After making a fantastic slideshow on iPad with Photo Slideshow Director HD, you may want to transfer the slideshow video to Desktop PC. Then you can copy it to USB drive for playing on HDTV, or burn to DVD disc, and etc. You can move a iPad slideshow to computer in two different ways: 1. Wireless transfer to PC using Photo Slideshow Director HD’s built-in WiFi transfer. Read Tutorial>> 2. Transfer the slideshow to PC using iTunes. How to transfer a slideshow to computer from iPad using iTunes? Step 1 : Output a slideshow to a movie file. Please tap the “Export” icon on the main screen toolbar and share movie to “Photo Library”. After touching “Photo library”, a window will pop up, asking you to enter title and description for the slideshow. Then choose a video resolution for 360p, 540p and 720p. Although the video encoding speed is really fast on iPad, especially on the new iPad, you still need a little patience. To encode a 5 minutes video of 720p, it may take about 8 minutes. Step 2 : After encoding is finished, the slideshow video will be saved to your iPad Photo Library. Now connect iPad to your computer using USB data cable. Step 4 : Please find our app icon (its name is “PhotoDirector”) and select the .MOV/.MP4 slideshow videos you just created, then click the “Save to…” button to save the videos to your computer hard drive. Then you can copy the slideshow video to USB memory stick or burn it to DVD.